We strive to make your arrival and first few weeks at Syracuse University as smooth and enjoyable as possible. It is essential that you read all this information very carefully to ensure that you make all preliminary preparations and bring all the pertinent materials with you when you come to the university. August 14-16. The general portion of the orientation program offers a mix of concurrent and large-group sessions on various topics designed to prepare graduate students for their roles as teaching assistants (TAs). ITAs attend this portion of the program as well. Please register for the orientation. August 20-24. Departmental orientations occur within this time frame. AIRPLANE: Syracuse Hancock International Airport is about a 15-minute drive from campus. TRAIN or BUS: The William F. Walsh Regional Transportation Center (RTC) is served by Amtrak, Greyhound, Trailways, and Megabus. The RTC is about a 10-minute drive from campus. Centro buses (city bus) run from the RTC to campus on a regular basis. COMMUTERS: Information about parking permits may be found at the Parking and Transit Services website. All permits are issued at Parking Services located at 621 Skytop Office Building on South Campus and require a valid driver’s license, car registration, your SU ID number and your appointment letter. Please note that there will be limited bus transportation between Main Campus and South Campus before the start of classes. Specific times and locations will be available at orientation registration. The summer bus schedule is also available online at Parking and Transit Services. To help you navigate campus, please download our Campus Map. There are also numerous map signs located around campus. Additional campus maps can be found on the Syracuse University Maps Page. By definition of the United States Government, your teaching assistant appointment classifies you as an employee of Syracuse University. The Employment Verification System, which became Federal law in 1986, requires the University (as an employer) to examine original documents to establish identity and authorize employment. Two forms of photo identification are necessary in order to process your paycheck. Please view the list of acceptable documents. Go to the patient portal and fill out your health history as accurately and thoroughly as possible and upload your immunization and physical examination form. If your health history, immunization and physical examination information is not completed and uploaded to the patient portal prior to your arrival on campus, a hold will be placed on your MySlice account and you will be ineligible to register for a second semester. You may also find useful information on the Health Services website. Because there is very little time during the orientation, you should plan to allocate two or three days BEFORE the orientation to find a suitable residence for the 2018-19 academic year. Contact your academic department to put you in contact with current graduate students who may know more about local housing opportunities in the University community. Contact the offices below for more information about apartment options both on and off campus. By the start of the orientation, you should be established in your permanent housing. Should you need temporary housing during the TA Orientation, please complete the Domestic TA Housing Request. Housing will be at Booth Hall during the orientation will be at your own expense. The room fee is estimated at $46.00 per night plus a one time $12.00 linen charge. If you need new linens you will be charged an additional $12.00 each time you request them. These fees may change. A team of experienced teaching assistants, selected on the basis of their outstanding performance in the classroom, have been designated Teaching Mentors and will serve as the program’s core instructional staff. 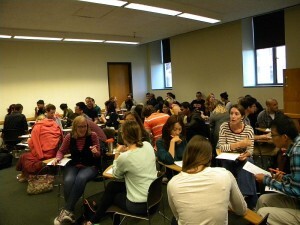 Each new TA will be assigned to a small discussion group led by a Teaching Mentor. All TA orientation participants will be expected to make a brief presentation to other TAs in their small group. This presentation will be recorded, after which you will have the opportunity to receive helpful and constructive feedback from your peers and Teaching Mentors. Pick a topic that would normally be discussed in an introductory course in your discipline. Assume that you will have a general audience who knows very little about your subject. Next, prepare a 5-minute presentation on this topic. You might explain a basic concept, illustrate the application of a concept, or define a problem. Whiteboards and overhead projectors will be available for your use. Classroom computers and video projectors are available in most rooms. For more information about microteaching, please view this short video that have we produced as an introduction to the exercise. The TA Orientation Program has been instituted by mandate of the Syracuse University Board of Trustees. Attendance is mandatory for all first-time teaching assistants.